Hasting’s Carpet can help you with many of your carpet and upholstery stains, but here are some tips Shaw Floors for addressing household stains in a manner that won’t damage your furnishings. No carpet is stain proof, but since many are stain resistant, you have time to act. Select your stain from the drop-down menu to get specific instructions, or refer to the general guidelines below. Remove as much of food spills as possible by scraping the carpet gently with a spoon or a dull knife. Absorb wet spills quickly by blotting repeatedly with white paper or white cloth towels. Always blot; never rub or scrub abrasively, as a fuzzy area may result. When blotting, work from the outer edge in toward the center of the spot to avoid spreading the spill. Remove the stain using one of the cleaning items from the checklist below. 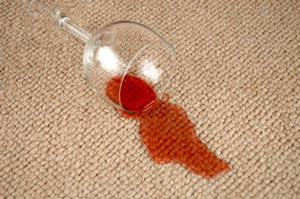 Rinse the cleaned carpet area with water to remove detergent residue that may become sticky and cause rapid re-soiling. Absorb any remaining moisture by placing several layers of white towels over the spot and weighing them down with a heavy object. This step is necessary even when the carpet doesn’t seem particularly damp. Vinegar solution — Mix 1 part white vinegar to 1 part water. Copyright © 2015 Hastings Carpet . All Rights Reserved.